Do you know these days, that from the moment you wake up, everything seems to go wrong? Well, today was one of those days for me. I woke up from the alarm of my boyfriend, about half an hour before my own alarm. When I finally started to fall asleep again, he entered the room because he needed something. I can tell you this was not good for my mood! I don’t like Mondays so much. Is the longest day of the week (OK, I know it’s not, but often it feels that way). Starting like that really made me apprehend my day. When I got up things didn’t get better. And I noticed I was thinking things like: “OMG, this day is going to be loooooong, and hard, and oooohhh, I want this day to be over, but it’s only just starting...” And then I stopped myself. I realised I was only going to make things worse. And that’s really not what I wanted! I wanted the day to be nice and easy. I even wanted it to be amazing! So I chose to make it so. Yes, I chose to, because it really is a choice! You can choose to stay in your bad mood the whole day, or choose to do things differently. Here’s what I did: I stopped my negative thoughts about the day. Then I started thinking happy thoughts about my day. About how I wanted it to be. My next step was to start looking for things to appreciate, things to be grateful for. These three steps made me feel so much better that I decided to take it further and to stop any negativity today, about anything. So not only was I not complaining, I also wasn’t thinking any negative thoughts. Also thoughts that don’t seem very important, but that ARE negative, like “I don’t have enough time to do all this”. And when my colleagues were negative about something, I answered in a positive way. Oh, and if I found a negative thought that wanted to enter my mind I stopped it. 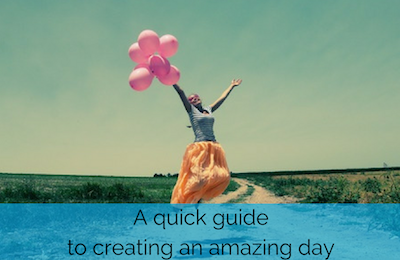 With these four easy steps my day became amazing! Nothing really special happened, but I felt great, the day went by very quickly (this Monday turned out to be not that long after all ;-) ) and I was really happy. For a Monday, this was AMAZING! 1. Stop your negative thoughts about the day. Stop apprehending your day. All these negative thoughts will only make it worse. 2. Think happy thoughts about your day. Choose thoughts about how you want your day to be. You can use affirmations as well if you like. For example: “I love this day”. It brought a smile on my face today and smiling is a wonderful way to start feeling better. 3. Look for things to appreciate, to be grateful for. This will shift your energy to a very positive one! And you’ll start attracting more positive things into your experience. Which will make your day better and better. Stop complaining, stop negative thoughts and react positively to negative people around you. I’m sure that if you follow these steps you’ll create an amazing day! If I can do it on a Monday, you can do it any day! Will you let me know how your day was? I’m looking forward to hearing from you! If you'd like to create an amazing summer, check out my special package Summer Magic. The perfect package to help you really take time for yourself and enjoy your summer even more! This magical package contains 4 magical meditations (mp3) and a 30-day summer journal (pdf). Click here to read more about Summer Magic.